I’ve been putting off doing this homemade trial for some time now because I’ve been scared of the results. I was afraid I would lose against the store bought mixes which would devastate me because I love making biscuits at home and tout my biscuits as pretty darn good. As always, the challenge with this Homemade Trial is to compare my homemade biscuit to a few store brands and see how they stack up! I use the categories of TIME, COST, NUTRITION, and TASTE to do the comparison. 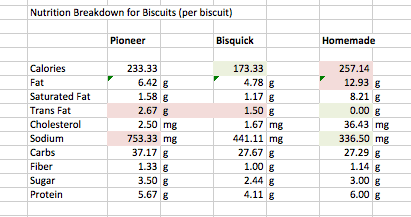 There are two popular biscuit type mixes that I wanted to compare for this version: Bisquick and Pioneer mix. They are both basically just mixes of flour, leavening ingredients, flavors and preservatives. All you have to do is add milk to them and you have dough. I used buttermilk for mine just to keep that variable the same for my biscuits. I don’t have some fancy biscuit recipe, but I do have a really good biscuit recipe. It has real butter in it (shock) and buttermilk (double shock). I knew that it produces biscuits that will be hard for a mix to beat. 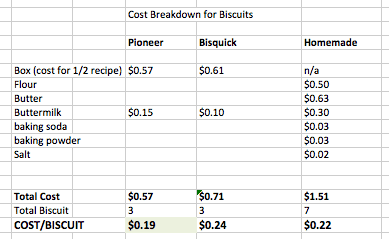 I compare a homemade buttermilk biscuit recipe to two popular store bought brands in the categories of TIME, TASTE, NUTRITION, and COST. 1) Start biscuits by mixing flour with salt and baking soda and baking powder in a large bowl. 2) Cut in cold butter or shortening using your fingers until it resembles small pea-sized pieces in the flour. 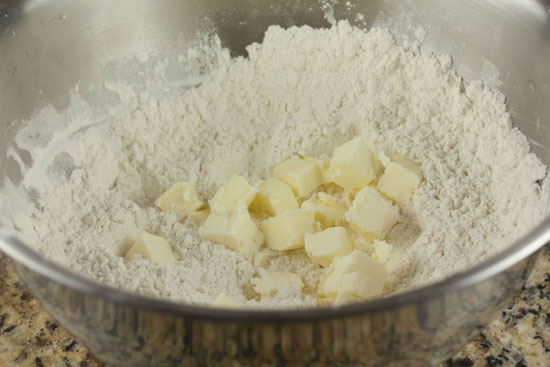 3) Add buttermilk and mix until the mixture forms a loose dough. Don’t over-mix the dough. 4) Scoop the dough out onto a floured surface and roll it out in a rectangle shape. Fold it into thirds over itself. Then roll it out gently and do it again. Finally roll it out until it’s about 1 inch thick. 5) Cut the biscuits out of the dough. You can either cut out circles or just slice the dough into rectangles. 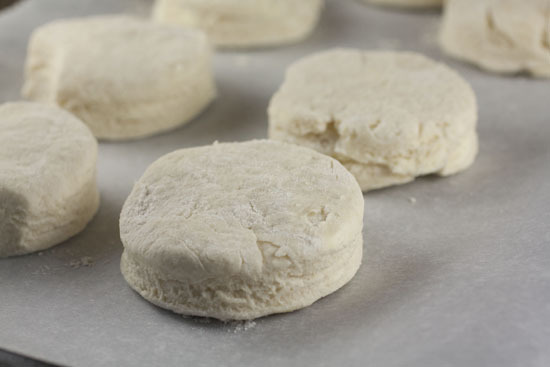 6) Add biscuits to an ungreased baking sheet and brush them with some extra buttermilk. Then bake them at 400 degrees for 20 minutes until they are golden brown. Adapted from a Tyler Florence recipe. Let’s get down to the breakdowns! This takes time… kind of. Honestly, I thought TIME would be a wash. Even though they are mixes, you still have to mix in the milk and shape and cut the biscuits, so how much time can you really save? The real savings though comes during cooking time unfortunately. I’m not sure how, but the mix versions only take 10-13 minutes to bake while my homemade version takes 20 minutes. I would say it is about a ten minute difference between the mix and homemade, but I still have to give TIME to the store-bought mixes. I was worried about cost for one reason: Butter. Butter is expensive and you don’t need any of it for the mixes. My homemade mix came out in the middle though and frankly, I used really expensive flour (King Arthurs unbleached white) so you could knock a few cents off of the homemade version if you went with a cheaper flour. Every version is within a few cents though so I’m saying that COST is a TIE. Another category that I was really worried about was nutrition. I mean… I used real butter for my version and lots of it. How could I not lose this category?! Here’s the weird, color-coded breakdown. As you can see, the results are all over the map. There isn’t a clear nutritional winner here and that kind of makes sense. After all, nobody eats biscuits to be healthy. The good news is that my homemade version has ZERO trans fats, which are really bad for you, and way less sodium than the mixes. The bad news is that it has more calories and more overall fat although I’m not in the camp that thinks fat is necessarily bad. I’m really tempted to give this to my version just because of the Trans fat deal, but I think to be fair I have to call NUTRITION a TIE. Biscuits aren’t healthy… doesn’t matter the source. I was shocked by this category because I didn’t blow the mixes out of the water. To be honest, they were pretty tasty right when they came out of the oven. The homemade version had a slight edge just because it was really flaky and tasted like delicious butter. It was everything you wanted in a biscuit, but the mixes also produced pretty decent biscuits. The real test was that I let all the biscuits cool down complete and then tasted them about four hours later. It wasn’t even close. The two store-bought versions had turned into tiny bricks. They were super-hard and tasted kind of chemically. The homemade ones were as good as they were right out of the oven, but they were still flakey and butter tasting. They were still pretty good, in other words. So my advice is that if you are going to use a mix, eat them immediately! Overall though, I’m giving TASTE to my homemade version. This was a close one! We had two ties and two pretty close other categories. The thing that shocked me the most I think was that the store-bought mixes produced pretty solid biscuits right when they came out of the oven. They were salty and good and would be fine with Jam or honey or gravy. Mine were better though. And at the end of the day, if I’m eating a biscuit, I want the best biscuit I can get so I’ll keep making these homemade whenever possible. Plus, I’m pretty sure I was very lenient on the Nutrition category. Trans fats are nasty stuff. Oh, I don’t know. Homemade are so, so much better, not just in taste but in texture, as you noted. And one thing you didn’t do, is compare yours to canned biscuits. Mixes are one thing — you could probably make your own “mix” by combining your dry ingredients ahead of time. But canned biscuits are the true, commercial “fast” biscuit. And, as I’ve said before, I don’t consider the fat in your butter to be a downside. But the sodium in theirs? Yeah. I do not think that 7 minutes of cooking time leads to a WIN for the box mix. If the amount of time mixing/making the biscuits is about the same I would give this a TIE. I think of time as active, not waiting for a warm biscuit. In my opinion, homemade wins hands down!I have tasted all three versions, I refuse to eat canned biscuits. My mother made the best buttermilk biscuits She never used a store bought mix to make her biscuits. Interesting results! 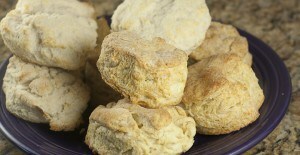 I make “drop” biscuits, so that could shave some time off if you are in a hurry to make them. (I never have good luck rolling them out and cutting them–they always turn into hockey pucks when I do that.) I also found a recipe for making your own “bisquick” mix that is actually pretty awesome. It uses lard (or shortening) instead of butter and makes a TON of mix. I could send you the recipe if you’d like. dude your recipes are always good. i just posted your crumb cake muffins with a couple twists. Damn you…I am now craving biscuits and that’s the last thing that I need right now! I’m a baker and generally make everything from scratch but now that I have two kids who expect to go off to school after a big breakfast (and biscuits are a favorite) I give in and use the mixes more than I’d like to admit. Your comment about the flavor on the homemade ones when eaten later makes me want to rethink this…I may have to experiment with baking/freezing them and see how that goes. I agree with you, September. And freezing them is a REALLY good idea and time saver to continue with feeding the best you can in the time you have. (Without getting up at the crack of dawn to do it). Also commenting on the part where they taste like hockey pucks after a few hours- anyone ever try to drink a BK shake or McD shake after it melted? Or eat the fries after an hour? How ’bout a burger the next day? I think products that taste terrible after they cool off is a good indication of REALLY unwanted chemical additives and trans fats. Additives- my only needed reason to make as much as I can from scratch with whole foods when possible. Totally agree, Chris! A huge part of the reason I make so much from scratch is that I know exactly whats going into it. Our standard “breakfast bread” in our house is an amazing English muffin bread. Yes, it has white flour and no whole grains, but it has five ingredients and zero anything processed (and freezes really well…I’m all about anything I can make in larger batches to satisfy the bottomless pit that is my six year old son). I recently stumbled upon your blog and I find it fantastic. These “Homemade Trails” are awesome! I can’t wait to utilize some of your recipes for myself. 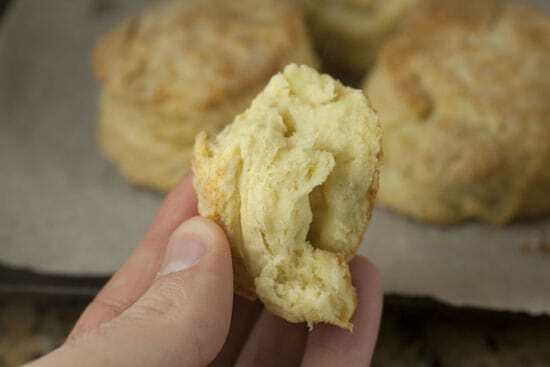 Having experimented with homemade biscuits for years now, I can offer a few suggestions that you might enjoy trying, and that I think give homemade more of an edge over any store-bought mix. (1) Self-rising flour is a biscuit baker’s best friend. Coupled with a pastry blender, I can have biscuits cut and on the baking sheet before the oven has even finished pre-heating. (2) Lard – it also has no trans-fat, and is much cheaper than butter. It gives biscuits a fantastic and very delicate crispness on the outside. (3) Bake at 425-450F. Higher temps = improved oven spring, and lighter, flakier biscuits. I was once told that biscuits are “80% technique and 20% ingredients”, and I believe it. As my skills have improved, I’ve cut the shortening down to 1/4 cup (per 2 cups flour). Is the taste or texture noticeably different? Nope, not at all, in my experience – and that gets the fat content down into the same territory as the baking mixes. Thanks for putting together such a fantastic site! which of the boxes rated the best? what about pancakes and waffles? Meh… I don’t think I had a favorite. They were pretty close. I don’t really use pancake/waffle mixes. It’s too easy to just mix up a batch. Good luck! What brand would you rate better? And what about pancakes and waffles? What is your idea of abatch. What is your recipe for pancake and waffles? oooh ..women who make biscuits is a turn on …after twenty-seven years of marriage my wife still cant make mac-n-cheese from from a box she even burns tv dinners!The thought of women cooking is just a pipe-dream! Have you ever used your recipe as “Freezer Biscuits”? If so, did it work well?